Not far away just beyond the rainbow you can visit an enchanted castle with all of your princess friends. Picture Me a Princess is a magical coloring book with every girls fairytale dreams. This book includes castles, dragons, jewelry, 3 lovey princesses, and much more. 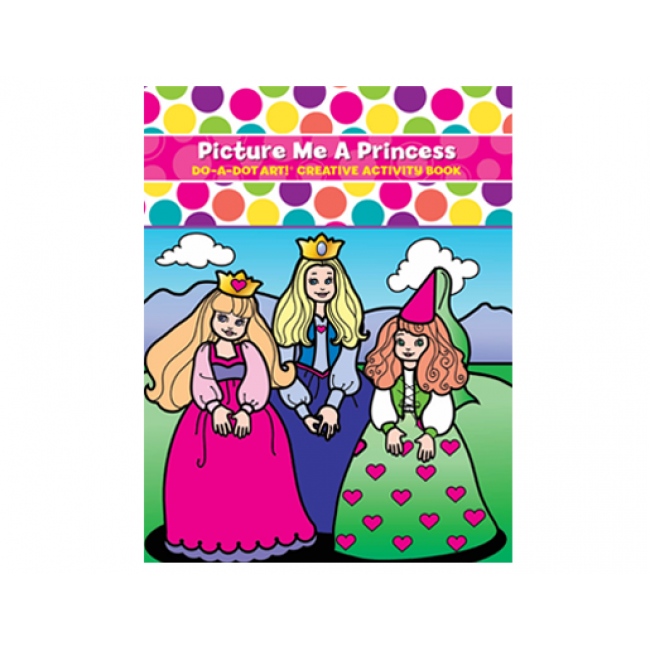 This is more than just a magical coloring book, you can decorate and wear your own princess crown, display your beautiful artwork, and see which of the three princess you are most like. Big, bold artwork makes it easy for children to feel successful when coloring in all of our fun art activity books. Designed to cultivate the budding artist in your little one. You will notice our graphics have been designed to work with the large sponge tips of Do A Dot Art! Markers, while at the same time not deciphering where each dot goes, so your little one has the joy of turning each page into their own work of art. Printed on heavy card stock paper to prevent bleeding. Perforated for easy removal and display.